Apple has released OS X Yosemite, officially versioned as OS X 10.10. The update to Macs is available now as a free download. OS X Yosemite brings a redesigned user interface to the Mac, as well as many new features that intend to improve productivity and interoperability with iOS devices. The newest version of OS X runs on all Macs that are capable of running Mavericks, if you haven’t done so yet, you can prepare your Mac for the Yosemite update by following a few simple tasks, including updating your software and backing up the computer before installing the free update. 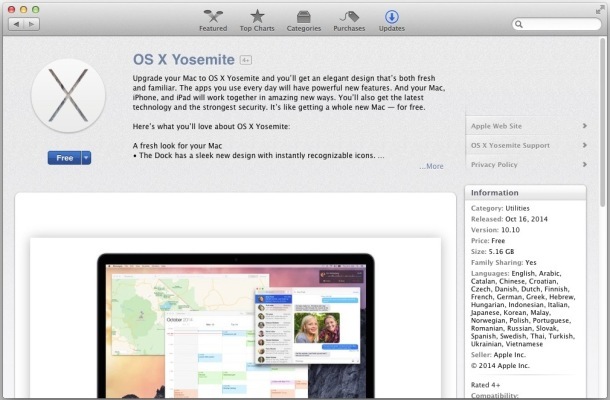 OS X Yosemite is available as a free download from the Mac App Store. To download and install the update, head to the  Apple menu and choose “Software Update”, the OS X Yosemite installer is several GB in size and can be found under the “Updates” tab. You can also use the download link below to head directly to OS X Yosemite in the App Store. To start the download of Yosemite on your Mac, simply open the above link and click on the “Free” button. The download weighs approximately 5.1GB and will begin immediately. If you are having trouble downloading OS X Yosemite, with either a “null” error, a “We could not complete your request” error, or a timeout, it’s likely due to Apple Servers being overwhelmed by requests. Simply try again, or wait a minute or two. Many users are currently experiencing a “This item is temporarily unavailable” error message when trying to download OS X Yosemite. This simply means you should try again later, as the download is likely propagating through Apple servers. This would be a good opportunity to prepare your Mac for the OS X 10.10 update and backing up the computer if you haven’t done so yet. Users who wish to create a bootable USB installer for OS X Yosemite will want to do so before completing the installation of Yosemite, or, at least make a copy of the OS X Yosemite Installer, which is found in the /Applications/ folder. Separately, new versions of iWork are also now available as a free download. hi , just a question , can i update to yosemite without a backup? i dont have time machine , if i go ahead and update will i loose my data or will it just update as normal with no loss ? Upgrading to Yosemite should not result in data loss – the point of an upgrade is to update the OS version, while preserving apps and data. With that said, backup. I know backing up is a pain, but it’s made super easy with Time Machine, and you’ll thank yourself one day when you have to restore from a backup or experience data loss. Trust me on this one. great thanks for answering my question. You need to download OS X Yosemite from the App Store from Apple, do not trust other than official sources for installing an operating system. When I download it, it say not available in the U.S store, which region store is is available in? It’s not available anywhere in the world just yet. It’s 4:32 pm EST (USA) here and Twitter is abuzz about the fact it’s not been released yet. Some rumors that it will go within 30 minutes from now when business networks slow at the end of the workday. Just a heads up to to those who think something is wrong during the install: If you find that OS X Yosemite update gets stuck on a white screen with Apple logo and a progress bar for a while – DONT DO ANYTHING – just wait, it seems to stall late in the process as the installation completes. DO not interrupt that update process, just let the white screen and progress bar go away on it’s own, yes it can take a while. It seems to be related to the state of the battery. If charging from a low charge while installing, Yosemite seems to hang in the last few minutes until the moment full charge is achieved. If charging and unplugging and re-plugging battery while charging, this also slows the installation. When installing on full charge while plugged in and no state change in the battery, Yosemite installs the quickest. I had not seen this forum entry. I got that white screen and it just sat there. So, after awhile, so I turned the machine off with the on-off button and rebooted with Command-R and restored Mavericks. I’m doing this on an iMac, not a laptop, so (with me) it was not a battery issue. I’ve been waiting for 10.10.1 because I’m afraid of going through the whole process again and finding the same white screen just sit there. Are you suggesting that I do just let it sit there … and for how long? I am facing issues downloading yosemite. its telling me that its currently unavailable in U.S store. any solution? The download is rolling out now across the App Store, it should be available to you shortly if you try again soon. Time is now 16:44 East coast U.S. Yosemite still shows as being unavailable in the U.S. store. Maybe they figure that NY, Boston, Washington, Miami, etc. aren’t looking to jump in and write reviews on their product. Ive been trying since noon does the same thing to me! Put in the search OS X or OS X Yosemite. It won’t appear in the update section. Same thing for me. You’re not the only one. For the beta program users, how is the adviced update method? Fresh install or the classic differential update is fine? Calm, same happen in Mexico Store, they are preparing the server to deploy by zones and don’t saturate servers. Any update let you know. Hi Tony, it’s not up in the UK yet. I don’t think that you people understand what “will be available today” and “Download Link Coming Soon” means….. it is not even 13pm in the US…. 13pm arrives right after 12th noon. Why have a link to “upgrade now” if it has NOT yet been released? Wow, with so many people waiting for the download I bet their servers will crash ! :) It seems that the download is not available anywhere. Because it is available to download, perhaps just not for you. That means you should hit Command+R to refresh, then try to download Yosemite again. thats when a new version of iOS 8.1 or 8.2 comes into play as well. talked to apple care they said it was still downloading to the server. She said possibly tonight or most likely tomorrow. Woohoo! Finally the download is available! BTW, how do you create a USB installer for Yosemite? Not yet here in San Diego…. The link just worked for me! It’s out in the US! If you are unable to download OS X Yosemite due to an error message, hit Command+R on the Yosemite page in the App Store, then click the “Free” button to successfully begin the download on your Mac. This just worked for me, it may be due to a caching issue. Yo, will this work in the final build? You probably don’t need to, in terms of build numbers the OS X Yosemite Public Beta 6 is basically the same as OS X Yosemite Final. But if you want to, you can download the entire installer and update – it will likely be unnecessary to update from the Yosemite GM 3.0 build or the Public Beta build, however. Any feedback on using Yosemite on 2009 MBP? – what conectivity features work and which dont? Anyone having installation issues with Yosemite? I downloaded, went through all the agreements, etc. It installed and then rebooted, Apple logo came up with another install and then to a totally blank white screen with a movable mouse cursor. Sounds like the harddrive is busy in the background but nothing happens. Totally blank, no status or installation update bars or logo, only the cursor. I’ve been all over the net and can only find stuff from June with developers posting all sorts of command structures for the beta that I don’t understand. Will it eventually just come up? Exactly the same thing happened to me on my late 2012 iMac, the download seemed to be ok, I went through all the legal steps, the white screen came up and the line status bar got stuck in the middle of the process. I pressed the power button to reset it, but it took me again to the same white screen, with no other option, and the process is again stuck in the middle of the line status bar. I did that 3 times, with the same results. Here’s what to do if your Yosemite installation is stuck. Rebooting mid-installation of any operating system is never a good idea. Would you try to start a car while the engine was being serviced? Hope you had backups ready! HUK same problem I have 3 computers 2 Blank screen 1 completed. Please help !!!! Does anyone know how to download the public version if you are currently using the developer beta version? But mac it still stuck on white apple logo screen and loading line status bar is kind of stuck in half way from last 4 hour . Dose anybody know how long will it take ? Has it happend to anyone out there? Same here, it shows 22, then 21 and again 22 minutes remaining; and this is for last half an hour. Any solution? If your Yosemite download is stuck pause and try again to resume it. If Yosemite OS X download is still sticking, cancel the download and then download it again. Anyone know how to turn off the Macbook Pro’s display with the lid open when connected to an external monitor? The nvram terminal command method no longer works with Yosemite. Does ” redesigned user interface” mean that we will have to re-learn to use our macs? I hate it when that happens! Just waiting patiently for suggestions about the white/blank screen (with only the moveable cursor). I’m stuck, but hopeful that there’s a fix. Just hard reset your Mac if the install hangs for a long time (hour +) by keeping the power button pressed untill the Mac powers down. Reboot and the install will probably continue and finish without a problem. Ok, I have installed OS X Yosemite, but iWork is still NOT for free. Where is free iWork ? Was this ever solved? 2012 retina 15′ with a mail app that will not open. Seriously killing my productivity. My 2012 Mac book air has been stuck at the gray boot screen for 12 hours. I’ve done the hard resets, but no luck. Calling AppleCare today, but does anyone have a fix in the meantime? Stuck at white screen of death as well. I’m currently beta version 6, will i still have to update yosemite to get the full version or do I have to download the full version from the app store? I downloaded many times the past hour. None of them were successful. If I made it through the last few minutes of the download, I see the error message “no internal inconsistency exception” – what is that supposed to me? How do I fixed it? Thanks. I mean supposed to mean… Sorry! I am in Uganda, the download is available on app store and am currently downloading. I am read some reviews and am not sure if am to install but am gonna try. How can you turn off the MacBook Pro’s display with the lid open while using an external monitor on Yosemite?? This do not work on Yosemite. I hope an update resolve this troubleshooting! Just installed Yosemite. I must say: it is just incredibly ugly. Who designed the hideous Red/Orange/Green buttons – looks like they were designed by a 3 year old. The Menus look like you are running Windows XP – hideous colours, idiotic transparency … The whole thing feels ugly, bland and corporate. Getting rid of it … moving back to Mavericks. Hi. I have successfully downloaded Yosemite but on installation it is going part way through then just freezing. Nothing. I have heard you have to wait it out but it’s been the same for the past 5 hours. That can’t be right surely? Hey. I factory reset my mac every monthish, and forgot to reset before i upgraded. Now that I’m on yosemity, when i restart and hold option, i now only see mac hd. not recovery disk. Can anyone help? Hello, my mac is frozen while i was trying to update it. It showed a message about the update was not going well and sent it to apple and now i can’t do anything with that. I didn’t back up it, so i hope nothing will happen to my mac:( what should i do? after down loadeding osx yosemite came up saying needed to download java 8 did this but now every time i turn on mac apple logo comes up with loading bar after loading loading all is ok why does it keep having to load ? cmd L not working! stuck at logo and half black/ half grey loading bar for 3 hours now. Very amateur effort from apple. Fine if needs to take a long time but dont make everyone scurry on the internet for solutions and reassurance. Put it in a troubleshooting guide or warning. Some people rely on their computer to earn a living, A stunning act of hubris apple team! get professional. Hi Scott, can you please let me know if and how you sorted this. You should see the download speeds in Japan or South Korea, a 5GB file like the Yosemite installer would take about 5-15 minutes! No you should only download system software from Apple, sketchy sources like a torrent could pack anything they wanted in there. Download OS X Yosemite from the App STore. After upgrading to 10.9.5 my macbook pro retina screen looks like a negative photograph. I have no idea why or what to do? I love Apple products; however, I have installed Yosemite and have had nothing but trouble ever since. My MacBook is much slower and every time I boot it up, all I get is the infamous white screen with the Apple logo and a progress bar. So very frustrating. i am not allow to download again although try several times refresh the purchased page. After downloading Yosemite (over about 7 hours), I woke up this morning to see the unhelpful message “An error has occurred” on the screen on which you download the update. I’m running a 2009 iMac. Anyone come across this error??? My screen is stuck on “Os X could not be installed on your computer. File system verify or repair failed quit the installer to restart your computer and try again.” IVE restarted my computer to “try again” five times and this still comes up. Do I need to take it in an Apple Store? I’m a college student and my whole life revolves around my MacBook. I can’t exit out of it at all. I had to try the download 4 times. It kept getting stuck with the blue bar almost across saying 30 min left. it got stuck there every time. Finally on the 4th time it went straight through and download was successful. People are advising that you just wait, but if it isn’t doing anything after 2-3 hours, you should try again. My daughter graduated from Vassar in May 2014… 2 weeks after graduating her university-purchased 2010 MBP crashed out with her thesis and 4 years worth of college information on it. I am a Tech Support “professional” and although I’m not really a “MAC” user, I supposed I can tackle the task of repairing this MBP. Ok, I have a 120gb solidstate harddrive and I will install it, but where can I get the Operating System? From what I understand Yosemite is the lastest OS.. fine. ???? I don’t have a CD.. Now what? I installed Yosemite and once it restarted, it has been frozen on the white screen with the apple halfway loaded for 3 and a half hours. What should I do? Not sure if this was asked before. I have upgraded to the latest OS but now want to do a clean installation. The installer file is no longer available. Any advice on how to go about it? I attempted a clean installation and it has been a spinning globe whose progress is inconsistent…it shows complete and reboots then it starts all over. Now it stops and shows apple.com/support with error -2005F. I can’t even access the options for time machine and others.